Almost nobody visits Vermont in the fall without a camera. If you want to take the opportunity to improve your photography with professional instruction or guiding, Northshire Digital Arts, our digital media unit, has several offerings for you. There are more computer and photography classes being finalized and we will post them soon. You can meet the group at Merck Forest in Rupert or free group transportation is provided from The Tutorial Center in Manchester. 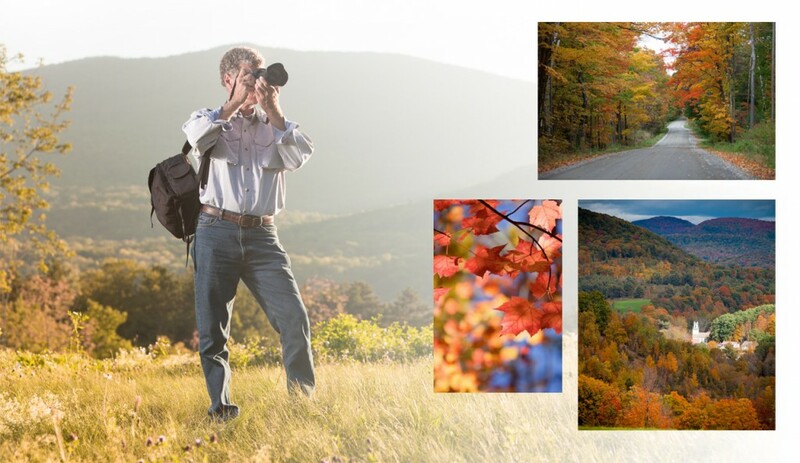 You’ll be at Merck at around 9:00am and will spend the morning photographing Vermont’s natural beauty – from macro florals, brilliant foliage, stunning landscapes and animals. The walk to the farm center is an easy walk but more strenuous hikes can be arranged if you prefer. You’ll head back to Manchester at 12:30 for refreshments along with photo sharing and critique. You can register for either date online using the form below, or call Christine at 802-236-3488. Please add any information that you think will help us create the best experience for you. How did you hear about Photo WalkAbouts? Once we receive your reservation we will send you a confirmation and provide instructions on how to make your payment and complete your reservation. We look forward to enjoying Vermont's foliage with you! Arrange for your own personal photography excursion in a variety of Southern Vermont settings such as Manchester Village or other local agricultural and natural areas. Led by a professional photographer, your instruction will be tailored to your interests and skill level. These Photo Walk-Abouts are available to visitors and residents, and can be arranged for 2 to 4 hours depending on your interests. Small group transportation provided. You’ll find all the information here. < The Know-How You Need! New Computer Classes!